In a city like New Orleans, community is everything. Walks down the street, one can simply speak to everyone passing by, and everyone would keep an eye out for one another. Everyone was each other’s neighbor. Eight years ago, prior to Hurricane Katrina, walking around the Lower Ninth Ward meant passing several homes on every block. Now it means visiting one, maybe two, houses per block. As a result, a sense of community has disappeared from the area. With very few residents returning to the Lower Ninth Ward after Hurricane Katrina, many lots stand vacant, some filled with weeds and trash, others still are home only to dilapidated buildings. For Lower Ninth Ward residents, there is a movement afoot to, in a sense, take back the streets through improved stormwater management. With the help of an EPA Environmental Justice Small Grant, Groundwork New Orleans assessed community needs to address issues of stormwater management, ecosystem restoration, and quality of life. In the midst of the assessment, a common theme was recognized: lack of communal connection. Residents had simple requests like planting more flowers to attract butterflies back to the area. As a result, a rain garden was installed to mitigate flooding and grew into a beautiful green space for neighbors to gather and get to know one another. Central to this process was engaging local residents in identifying solutions. For example, Lower Ninth Ward residents’ needs and input was instrumental in creating a site that removes toxins from stormwater and provides an educational and beautiful space for residents to enjoy. A corner lot at Caffin Avenue and North Prieur Street was selected to create a rain garden and community beautification site. The site, located near the Industrial Canal levee breech that inundated the neighborhood during Hurricane Katrina, contains a shade structure, rain garden, native plants, fruit trees, benches and educational signage. After a few months, the site has become a communal space where neighbors can feel welcomed, help alleviate street flooding, and improve watershed health along with neighborhood aesthetic. Members of the Green Team, a training job program for high school aged youth, are a part of the process from start to finish. The students learn about research methods, public speaking, community engagement, science, construction, and water testing. The students are gaining valuable life skills while making improvements in their community, like using GIS mapping to plot drainage problem areas along Caffin Avenue and conducting water quality testing in Bayou Bienvenue. The results compiled from these activities were presented to neighborhood residents and organizations. At each workshop the Green Team leads a hands-on activity to share what they have learned and educate the community. The restoration of Bayou Bienvenue is an important part of the rebuilding of the community because it can provide opportunities for fishing, canoeing, and other activities for local residents. Engaging the community in understanding how a neighborhood-level watershed and habitat design can reduce susceptibility to flooding is helping to usher in a sense of communal connection so that the community heals while helping to heal the environment—now the focus of an EPA Urban Waters grant. Local residents are important voices/advocates for change. Groundwork New Orleans and EPA continue to work on stormwater management in the community. Even years after Katrina local residents are informed and empowered to continue to heal the environment and clean up and beautify areas around them. In 2014, Groundwork New Orleans received both an EPA Urban Waters grant and an EPA Environmental Justice Collaborative Problem-Solving grant to support the work identified by the community such as creating more green infrastructure features on the site, a “Don’t Dump Dat” campaign, stakeholder coalition building, tree and flower plantings, community clean ups and stormwater management education workshops in the area. The green infrastructure work was funded in part by a $100,000 grant from the NOLA Sewerage and Water Board. Groundwork New Orleans is a 501c3 organization dedicated to the belief that by changing places we can change lives. We believe a sustainable community starts with a vibrant, healthy and safe environment for individuals and enterprise to prosper. 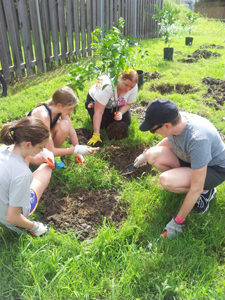 Groundwork New Orleans achieves its’ goals by engaging residents, volunteers, businesses and local organizations in practical projects that improve quality of life, restore the ecological function of the physical environment, and lay the foundations for sustainable development.